Project Title: Genetic Structure of the Southwestern and Southeastern Florida Loggerhead Rookeries: One Panmictic Population or Multiple Demographically Independent Subpopulations? Summary: The research project seeks to address outstanding questions regarding genetic population structure among loggerhead subpopulations nesting on peninsular Florida beaches. Population structure analyses conducted with samples collected in 2006 (and some sites in 2007) suggest that current recovery units outlined in the Recovery Plan for the Northwest Atlantic Population of Loggerhead Turtles do not fully reflect genetic and demographic partitioning among peninsular Florida loggerhead rookeries. However, it remains unclear whether southwestern Florida rookeries are sufficiently genetically differentiated to warrant further subdivision and to warrant subdivision from southeastern Florida rookeries. Genetic analyses conducted to date have been limited by small sample sizes and/or insufficient geographic coverage to make robust inferences about the integrity of inferred subpopulations (management units) or the precise boundaries between them. Collaborators dramatically increased sampling effort during the 2007 and 2008 nesting seasons to address: 1) management unit status and boundaries for southwest Florida through mitochondrial haplotype analysis, 2) temporal stability of haplotype frequencies within sites (Casey Key and Keewaydin), and 3) the genetic relationship of southernmost Gulf and southernmost Atlantic Florida rookeries. Results: We produced expanded control region sequences for 2150 samples representing primarily Florida Gulf coast loggerhead rookeries but also including archived samples from key rookeries from the Atlantic coast. Through collaboration with the Archie Carr Center for Sea Turtle Research, we also produced longer control region sequences for Dry Tortugas and Cay Sal, Bahamas samples that had previously been analyzed for the short sequences only. The novel haplotype data from the Gulf coast provided support for recognition of four management units for loggerheads nesting on Florida’s Gulf of Mexico beaches: northwestern Florida, central western Florida (Pinellas County through Sanibel-Captiva), southwestern Florida (Ft. Meyers beaches through Collier County), and the Dry Tortugas (along with Cay Sal, Bahamas). Additional sampling is required in the Ten Thousand Islands area and Cape Sable to determine if these rookeries are affiliated with those to the north, which is the most likely possibility. 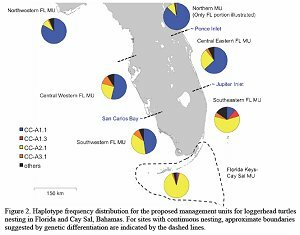 Combined with haplotype data from the Atlantic coast (produced by project 09-12R), the novel Gulf coast haplotype data provide strong support for recognition of distinct southwestern and southeastern Florida management units. Therefore, we tentatively propose recognition of seven management units in the southeastern United States and the Bahamas: 1) northern management unit, 2) central eastern Florida, 3) southeastern Florida, 4) Cay Sal and Dry Tortugas, 5) southwestern Florida, 6) central western Florida, and 7) northwestern Florida.